The more I work with Affinity Photo, the more I like it. There's a couple of things that keeps me from leaving Photoshop still, and one of those things are very important for me when I create game assets. I think these types of DDS are the most common. DXT1, DXT3, DXT5 and 3DC. Because it's a pre-compiled/compressed image format which is loaded to the GPU at runtime. Some game-engines can handle this conversion when you import a TGA, PNG or what have you, while others require you do this before importing to the game engine. In the case of making mods, you don't usually have access to the game engine the game is using directly as a developer, and you're bound to making these DDS files prior to testing the asset in-game. Please consider this, Affinity! I know a many hobbyists, modders or even developers who'd most likely get Affinity Photo because of this feature alone, because they won't pay a monthly fee to get Photoshop. 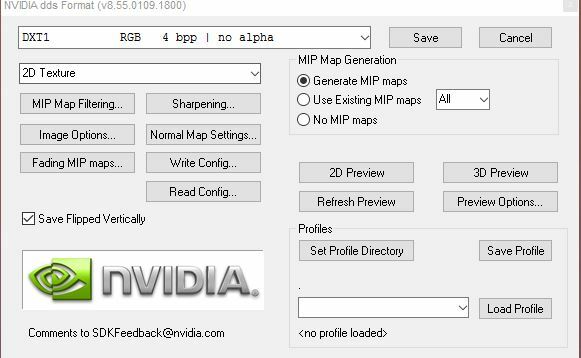 There's another thread here requesting support for the nVidia DDS plugin. Oh, ok. Sorry. Didn't know that. It didn't show when I searched for DDS export.